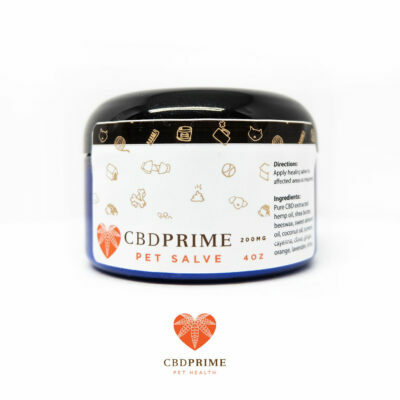 CBD Prime Pet Health Salmon Oil contain pure CBD and are made with Pink Alaskan Salmon oil (Omega 3) & to ensure seamless consumption. 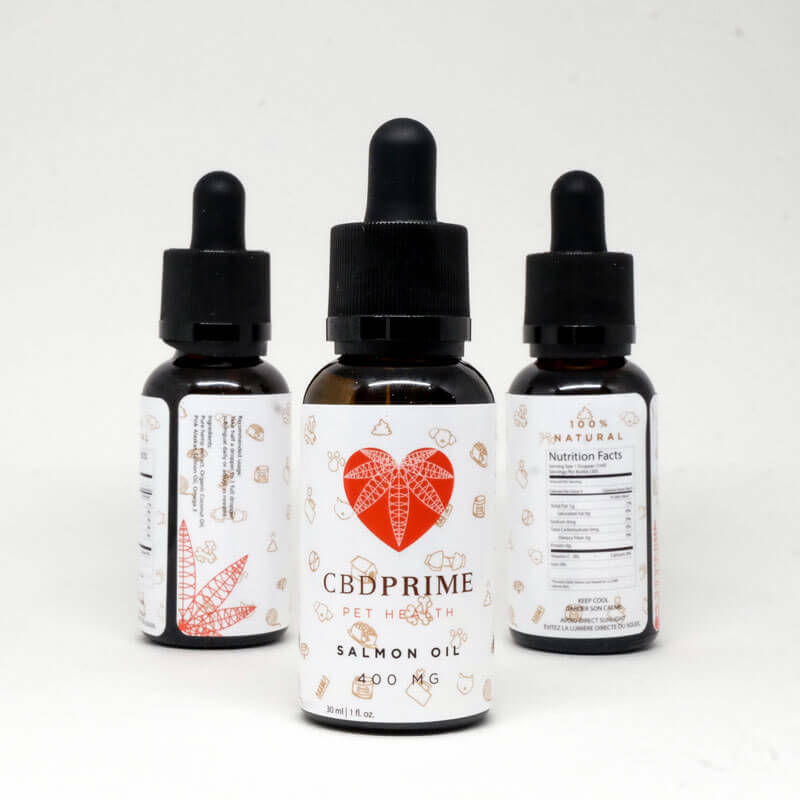 This product is one of the first pet-focused CBD options in Canada and targets anxiety, depression and pain relief. 2-3 full droppers, daily. (Approx. 13mg/ml. 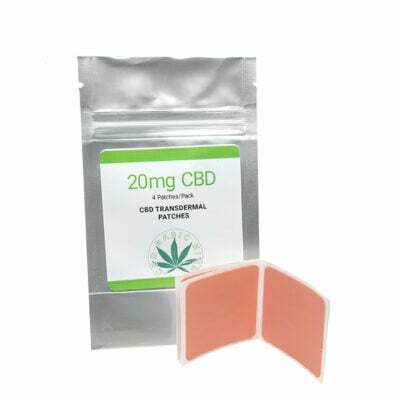 This product is NON-THC; your pet will not get “high” from this.Adjust your dosage according to the pet’s size, weight, and conditions. How to use: Put it in your pet’s food or directly in their mouth. 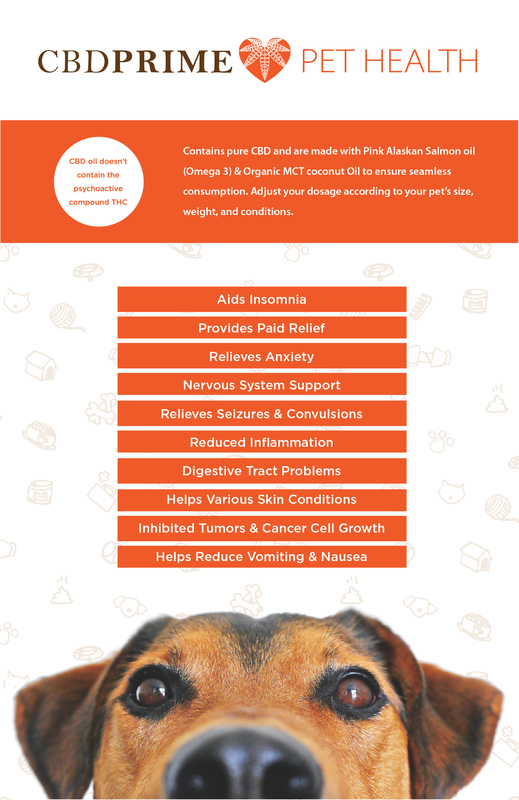 Perfect for small pets or pets with mild to moderate health conditions. My 13 year old cat is having a rough go of it lately. Had lost some weight over the last year and is very bony. He didn’t much like to be pet anymore, would walk away. So he’s be on this for over a month now. Seems happier and will take the lovings when he can. I’m sure it’s done wonders for any pain he was in. Our 13 year old Golden Retriever has cancer and arthritis. 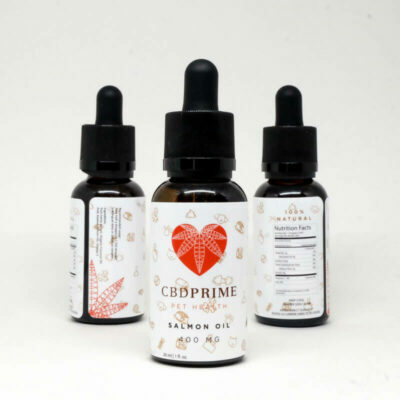 This CBD oil slowed the growth of her tumors and seems to have given her back the mobility she had lost. My 8 yr old German Shorthaired Pointer was starting to have Arthritis/Hip pain that led to a number of issues. Absolutely swear by this stuff! My dog loved this. Give by mouth or put on food to encourage lack of appetite. I tried this on my 9 year old yorkie one week ago. Since then my dog has the softest fur ever and a new spring in her step! When I put it on her food she eats it all. Absolutely love this stuff! My 10 year old Doberman has become anxious and has developed arthritis in her older years. Now that i give her the CBD oil, Ive noticed she’s less anxious and doesn’t show signs of stiffness. She also suffers from fatty tumors which Ive noticed shrunk in size. I love this stuff… go figure why it’s always out of stock! Put your name on the waiting list and try it. You’ll see more life in your fur baby. My Puli/Golden Retriever suffers from seizures and anxiety. The oil has decreased the severity of her seizures and definitely eliminated the anxiety, from the first dose. Amazing, but still working on dosage. I’m hoping it will take the seizures away completely. I am totally impressed.